Good day, everyone! Are you taking advantage of the very summery weather? I am enjoying all of the beach days although my air conditioner is cranked on full blast nearly all of the time. 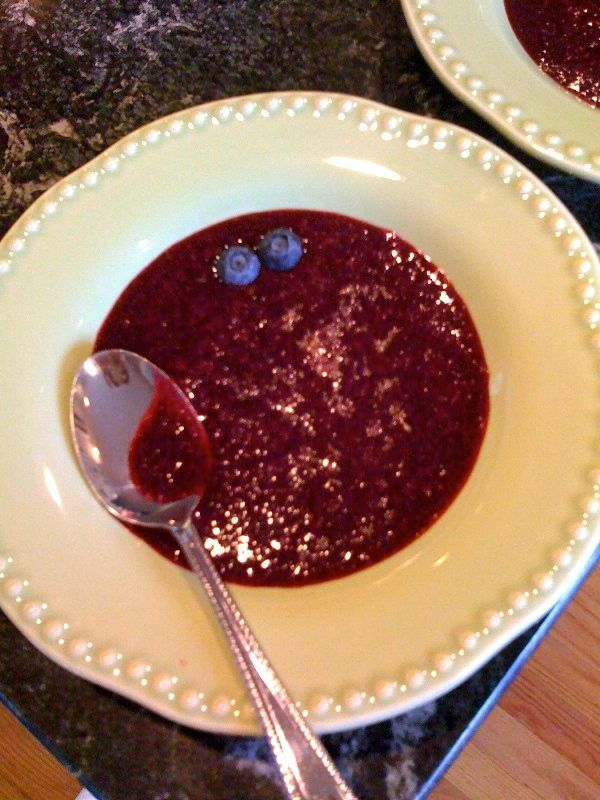 When I saw this recipe for “Royal Blueberry” Gazpacho with Lemon and Mint in the July 2012 issue of Cooking Light, I have to admit, I was interested. The hot summer weather makes a cool fruity soup sound like a great idea. Plus I had a plethora of blueberries since I came home from the grocery store with two pints (who can pass by a “buy one, get one free” deal? ), and then later that week I received another pint from my farm share. Needless to say, I was looking for a good blueberry recipe. This one pairs the blueberries nicely with red seedless grapes. I served the soup, as the recipe suggested, as a sweet starter to our dinner of grilled salmon, potatoes and vegetables. It was great! This mixture would also make a tasty popsicle – just freeze the liquid into some molds. SensitiveHusband and I also agreed that it would be a delicious simple syrup to add to a refreshing beverage with vodka and ice. To make the recipe a bit simpler (it was just too hot to dirty a food processor), I stirred the mixture and directly poured into a mesh sieve. I was also sure to use 100% grape juice to exclude the cane sugar from this dish. 1. Remove stems from fruit. Rinse and pat dry with paper towels. Place fruit in a 4-quart saucepan over medium-high heat. Add grape juice and honey; bring to a boil. Reduce heat to medium; simmer 15 minutes, stirring occasionally. Remove from heat; let stand 10 minutes. 2. Place blueberry mixture in a food processor; process until almost smooth. OR Stir the blueberry mixture briskly until all of the blueberries and grapes have split. 3. Strain; discard solids. Chill 2 hours. 4. Stir in rind, juice, and salt. Ladle about 1/2 cup into each of 5 chilled bowls. I am sharing this recipe with Simply Sugar and Gluten Free, Gastronomical Sovereignty, Miz Helen’s Country Cottage, Food Trip Friday and Cybele Pascal Allegen-Friendly Cook. This entry was posted in Recipes - Beverages, Recipes - Dessert, Recipes - Soup and tagged Blueberry, Cane sugar free, Grapes, Yeast free. Bookmark the permalink. Thanks for sharing it with us and for joining FTF! What an awesome recipe, I can’t wait to try this, and it is going to be today. Hope you are having a great week and thank you so much for sharing with Full Plate Thursday. i’m so glad you included an option with vodka. haha. my first thought was throw it in the freezer and make a vodka slushie out of it! thanks for visiting and joining up with us at the Wednesday Fresh Foods Blog Hop – we hope to see you this week again with another seasonal treat! Thanks for your comment, Erin! I look forward to checking out your site! Thank you for this honor, Miz Helen!